Published: Jan. 6, 2018 at 10:25 p.m. Updated: Jan. 7, 2018 at 01:18 p.m.
EDITOR'S NOTE: Tennessee Titans controlling owner Amy Adams Strunk released a statement Sunday saying Mike Mularkey "will be our head coach moving forward." KANSAS CITY, Mo. -- If Mike Mularkey's job was on the line Saturday night, he found the best defense for his value to the Tennessee Titans. He kept his team together when all seemed lost in their 22-21 AFC wild-card win over the Kansas City Chiefs. He led them to an impressive victory in a hostile environment by sticking with the same plan that earned Tennessee a playoff spot in the first place. It wasn't pretty, but it was enough to keep the Titans alive for another round of postseason football. The story on Saturday should've focused on how the Titans were playing in their first playoff game since 2008 and looking for their first postseason win since 2003. Instead, it was very much about the emotional roller coaster their head coach found himself riding. NFL Network Insider Ian Rapoport reported Saturday morning that Mularkey might lose his job if the Titans lost to Kansas City. It was news that the head coach admitted had a profound impact on how he approached this game because, as he said, "I didn't have any support to say that I was [safe], so I assumed the worst." As unfair as it was for Mularkey to be in such a position before the most important Titans game in more than a decade, it says plenty that he led his team to what may end up being the most crucial victory of his coaching career. The Chiefs dominated the Titans for the first two quarters, easily building a 21-3 lead in the process. At that point, all the talk about Tennessee possibly pursuing somebody like New England Patriots offensive coordinator Josh McDaniels made all the sense in the world. The last thing the Titans looked like at that stage was a team on the rise. Then a funny thing happened. 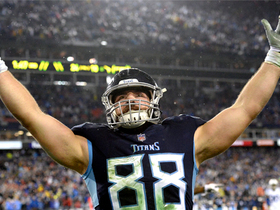 The Titans reminded us of what made them such a trendy playoff contender when this season began. It's not that they're the sexiest or most dynamic team in the league. Their appeal has more to do with their grit, their collective feistiness, their sheer unwillingness to buy into the same doubts that have hovered around them often this season. The Titans rallied to win this game simply by sticking with the same game plan they brought into it. 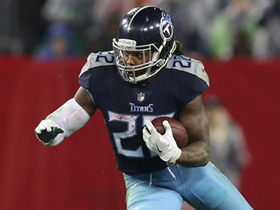 They continued to hand the ball to running back Derrick Henry, who finished with 23 carries for 156 yards and one touchdown. They kept relying on quarterback Marcus Mariota to make plays with his arm and his legs, and even his hands, as he scored on a six-yard reception after catching a pass that Chiefs cornerback Darrelle Revis batted back to him. The Titans defense also showed up in the second half, when it held the Chiefs to just 61 total yards. When asked about the effort his team gave, Mularkey said it's nothing new for a squad that has been scrappy all year. "The team we have, it doesn't surprise me," Mularkey said. "I don't know if you guys believe me when I say they come into the locker room and there's a look that we're going to come back and win. But there is. It's there on the sideline and always has been. I wish you guys would give them a little credit for it. We stick together and we have each other's backs and always have, and we came through today when we needed it." "Guys didn't blink an eye," said Mariota, who's engineered three fourth-quarter comebacks this season. "I think through this entire season -- the ups and downs -- the energy (around us) doesn't change. You have to give a lot of credit to the guys and the people in that locker room. We just continue to believe. These situations are going to continue to prepare us for what's ahead. It's a fun locker room and a special place to play." As impressive as Tennessee's comeback was, it still defied logic in several ways. The Titans trailed by 18 points and lost the turnover battle (two to zero) but still managed to come out on top. 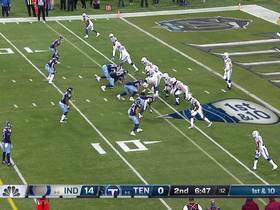 The Titans were outgained 127 yards to 264 yards in the first half before taking over in the second half, controlling the football for more than 19 of the game's final 30 minutes. 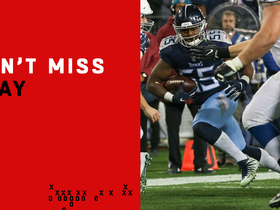 While most teams usually have to throw to rally in such dire situations, the Titans kept pounding the ball right at Kansas City. Tennessee did receive some crucial help from the officials -- they ruled Mariota down after he fumbled on a two-point conversion that Chiefs safety Daniel Sorenson returned 58 yards for a score that would've put Kansas City up 23-22 in the fourth quarter -- but that wasn't the difference in the game. This contest came down to the Titans exploiting the same issues that have plagued the Chiefs at various points this season. Kansas City struggled to stop the run in several games. It was their biggest weakness at the worst possible time once again. Henry's performance was especially gratifying. His backfield counterpart, DeMarco Murray, didn't play because of a knee injury, and Henry also struggled in a feature role a week earlier, when he gained just 51 yards on 28 carries in a regular season-ending win over Jacksonville. "I just wanted to have a better performance than what I had last week," Henry said. "I wanted to come out and execute the plays that were called and help this team on offense. I just wanted to run hard, run north and south, and finish plays. I had a lot of missed plays last week and that was in my head right up until kickoff." The Titans now have to wait and see where their playoff road leads next. If Buffalo beats Jacksonville in Sunday's AFC Wild Card Game, Tennessee will travel to Pittsburgh. If the Jaguars win, then the Titans head to New England. As Mularkey said, the only thing the Titans knew as they left Arrowhead Stadium on Saturday was that their next stop would involve a cold-weather environment. That, by the way, was perfectly fine for a head coach who called the rumors about his job security "ridiculous" and added that when news like that affects his family, "it has an effect on me. So, yeah, I'd say it had a big effect on me." Said Mariota: "Coach Mularkey has done an incredible job of handling this entire situation, and I think he's done a great job of keeping this team together. He's been keeping us focused on the task at hand." It's fair to suspect that this won't be the last time Mularkey hears discussions about his future with the team. He led the Titans to a 9-7 record in his first full season on the job and he took them to the playoffs in his second. However, this offseason is also turning into one where hot coaching candidates are being wooed like crazy. With Jon Gruden landing a reported 10-year, $100 million contract to leave broadcasting and return to coaching the Oakland Raiders, it could be very attractive for any team to pursue its own splashy hire. The problem with that thinking is that it sometimes means owners will ignore the value in what they already have. That should be the ultimate takeaway for the Titans after their first playoff win in a decade.